As I mentioned in the prologue, the primary focus of this tea primer is true tea, made from Camellia sinensis. As such, I am loathe to consider herbal infusions or tisanes as “teas” (heck, even Benedict Cumberbatch has waded into this fray). 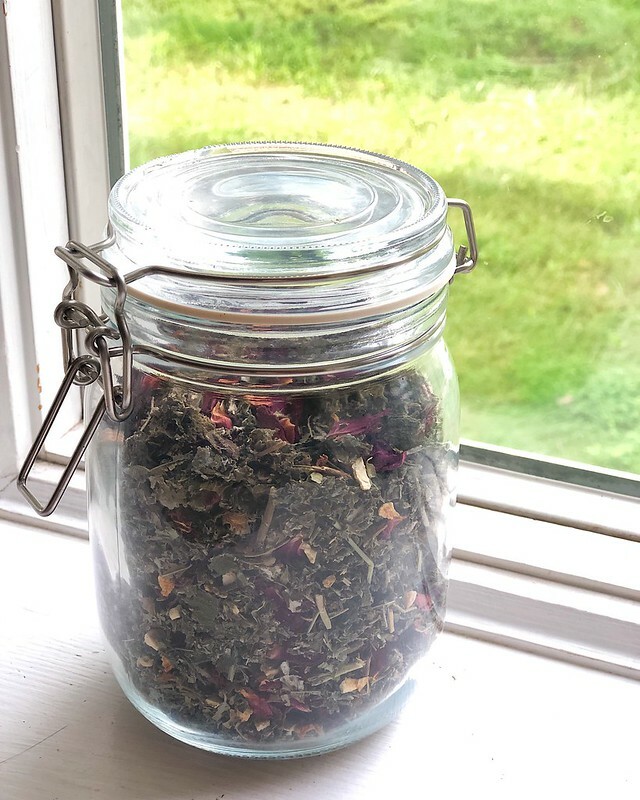 But I do frequently enjoy infusions and tisanes of herbs and spices, and I thought I’d talk a little bit about my philosophy on herbal teas, where I get my herbs, how I prepare them, and share some of my favorite blends. First of all, in herbals as well as teas, I prefer loose-leaf. I will use teabags in a pinch, but I find the flavor from loose-leaf herbs to be far superior. Plus, I love to create my own blends. One problem I have with commercial herbal blends is that they often contain ingredients to make them taste sweeter, or to cover the flavor of less palatable herbs. In layman’s terms, this usually means stevia, licorice root, or cinnamon, all of which I don’t particularly like. Cinnamon I can tolerate in specific blends, but only if it’s there for a reason, and not just to elevate the flavor of a blend with a particularly unpopular taste. So obviously the blends and opinions I share here will be heavily influenced by my own tastes. But the nice thing about blending your own herbal teas is that you can follow your tastes and see what works for you. Personally, I came to herbal tea from my investigation into amateur herbalism. I’ve taken some training over the years, and done some self-study of herbal medicine, and have a decent understanding of a limited field of common herbal remedies, which I use for myself and my family members for minor complaints. Do note that I’m not a medical professional or even a licensed herbalist and I can’t give you advice on what to use for your own complaints, just a description of what works for me. I’m talking about really gentle things like ginger for an upset tummy or a cup of chamomile tea before bed. But I think it is important to remember that herbs do have constituents that can affect our health, in both positive and negative ways. Personally, when I use herbs, I like to stick to traditional methods of ingestion: mostly infusions in water, with the occasional salve/oil/tincture/vinegar. I don’t generally take tablets or capsules of whole plants because most plants weren’t just eaten whole, unless they were food plants. Plus, I find a lot of benefit, personally, from the experience of a nice cup of tea than from popping a pill. But that’s just my preference. All that said, most herbal teas, drunk for taste and pleasure, are probably not going to have enough plant matter in them to cause a strong reaction, unless you have a specific condition. I think it’s important to know what’s in your teas and what effects it can have, but for the most part, expecting a strong medicinal effect from the amount of plants used in a cup of herbal tisane drunk for enjoyment is unrealistic. Personally, I’ve started keeping more of an eye on this since becoming pregnant, as the body can be more sensitive to certain actions, and also I sometimes brew my loose-herb tisanes stronger than the typical cup made with a teabag. I generally consult multiple sources to determine if there is any evidence that an herb might cause an adverse effect. Of course, almost all herbs are labeled with an obligatory “if you are pregnant or breastfeeding, consult your doctor” because there just aren’t a lot of studies of herbs on pregnant women. And similarly, there just aren’t a lot of studies of certain herbal remedies. So when I’m curious if a tea might have an adverse effect, I tend to check these three places: Mountain Rose Herbs (where I buy a lot of my herbs), Botanical.com, and WebMD. These three resources give different layers of information. WebMD gives me information any known interactions with medication or specific medical conditions (such as the possible blood-thinning effects of chamomile). Mountain Rose Herbs usually gives a warning if there is a specific action that you should be aware of (such as using caution when taking chamomile if you are allergic to other members of the Asteraceae family, which includes ragweed). And Botanical.com gives a more complete picture of the chemical constituents of an herb, its historical usage, and how different parts are used. That said, these are not the resources I used to gain a working knowledge of using herbs for my health, but that is a topic for another time. If you’re interested in gaining more knowledge about herbal healing traditions, I’d highly recommend seeing if you have a local herb store that offers classes. Finally, it’s important when choosing herbal tisanes and infusions to know exactly what plant you’re getting. True tea, as I’ve mentioned before, is from only one species of plant, Camellia sinensis, but herbs can have a multitude of names, and sometimes the same name can refer to different species of plants. Using the chamomile example above, “chamomile” can refer to Anthemis nobilis or Matricaria chamomilla. Fortunately, both of these have similar effects. But another example is cinnamon: what most of us have in our spice racks is actually cassia cinnamon (Cinnamomum cassia), which contains a chemical constituent called coumarin, which can have adverse effects in the body. Another kind of cinnamon, Cinnamomum verum, which is called Ceylon, sweet, or true cinnamon, doesn’t contain these coumarins. Both are sold simply as “cinnamon,” so it’s important to buy from a reputable seller who provides full Latin names if you have a condition that could interact with coumarins, to make sure you know what you’re getting (in fact, the form of cassia cinnamon sold at Mountain Rose Herbs is a third type of cinnamon, Cinnamomum burmannii, which can have even higher coumarin levels than C. cassia, but they clearly label the Latin name of the form they sell so you know what you’re getting). So Where Do I Get Herbal Tea? This all leads nicely into the discussion of where I source my herbs. As I mentioned, Mountain Rose Herbs is where I get a lot of my bulk herbs. If you’re very new, they sell herbs in a variety of sizes, so you can buy just an ounce or so of a bunch of different herbs. The shipping costs can be steep, but it generally balances out, and the quality is high. In particular, my absolute favorite dried peppermint comes from MRH. When you open the bag, your eyes water from the mintiness. And they ship things in thick, resealable, plastic zipper bags, so you can store your herbs in the bags they come in and be relative sure they will stay fresh. They offer a large variety of different herbs and spices and give the Latin name clearly, as well as a brief overview of uses and precautions right on the website. Plus, they have some extra things, like oils, butters, and accessories. As I mentioned, the drawback of MRH is the shipping cost. Sometimes, if you’re only buying a little bit, the shipping cost will be as much or even more than the price of the herbs themselves. So when I’m buying small amounts of herbs to test out an herbal blend, I will often turn to Etsy sellers. In particular, for herbs, I’ve liked what I’ve gotten from Mortar and Petal, which is sadly currently closed for the holiday season. But when I was buying small amounts of herbs to test out a new blend for my pregnancy tea, I liked that I could buy just half an ounce or an ounce of a few different herbs and have them ship in a small padded envelope, rather than paying for the whole box-and-bubbles deal that comes from MRH. Plus, it’s less packing material. But what about when I’m not in the mood to measure out loose herbs and muck about with an infuser? I’ve already admitted to using bagged tea for a real cuppa, and I will admit to drinking bagged tisanes as well. While I love my pyramid, whole-leaf bags for herbals as well as true tea, I also drink paper teabag tisanes. My favorite brands of tisanes that I can get in my store are Traditional Medicinals, Celebration Herbals, and Buddha Teas. All of these brands offer herbal “simples,” which means bags with just one kind of herb, which is nice, as well as blends. It’s important to read the ingredients lists and supplement facts for the blends to make sure you know what exactly is in the tea, though. I find that Traditional Medicinals, in particular, likes to add licorice and/or stevia to their blends to sweeten them, which I dislike. Also, other than Celebration Herbals, they’re not great about putting Latin names on the boxes sold in stores, so if you’re concerned about that, you’ll want to look them up on their websites. But for an easy cup of tea, especially when I’m not feeling well, I like using bags. It’s also the easiest way to carry herbals around without getting sideways glances for keeping a bunch of unlabeled jars of dried leaves in your desk cabinet. And it’s basically the only way I get my husband to drink a cup of herbal tisane when he’s sick. Finally, for spices and fresh herbs, I often just get my materials from my local grocery store. I’m fortunate to have a store nearby that sells a large variety of bulk whole spices, plus I generally try to keep a knob of ginger root on hand. And some herbs, I can grow in my wild little herb garden (mostly sage and peppermint, honestly). So first a note about terminology: Typically, a bit of plant that is put in some hot water and left to sit for a certain amount of time is called a “tea” or “tisane” or “infusion.” Some herbalists differentiate between “tisane” (or “tea”) and “infusion” by insisting that an “infusion” is a very strong steeping of an herb, meant to draw a medicinal quantity of the active constituents into the brew. I’m not quite so pedantic about, but I generally consider an infusion to be stronger than a tisane, and I also generally consider an infusion to be a cuppa brewed more for the medicinal benefit while a tisane is often just for the pleasure of it (although of course the lines blur). There are multiple ways to make a hot drink with non-tea plant matter. Personally, I like to steep most leaves and flowers similarly to how I would steep a tea — plunk a bit of it in hot water, let it sit for a while, and then pull the leaves out and enjoy. If I want something stronger, I’ll put a large amount of plant matter in a heat-safe jar, fill with boiling water, cover and steep for an hour or more before straining. But generally, I brew a cup of “herbal tea” by taking a tea bag or 1-3 teaspoons of loose herbs and steeping them in boiling water for 5-15 minutes, depending on the plant in question. It definitely helps to play with brewing parameters with herbs because different herbs have different flavors and strength of flavors. Now, this is for dried herbs. It is absolutely possible to make an enjoyable tisane from fresh herbs, but you have to remember two things: 1.) fresh herbs have more water content and will have less concentrated flavors, so you will need more plant matter for a brew, and 2.) fresh herbs will often have a different flavor than the dried version. For example, I love fresh thyme’s citrusy notes, but dried thyme isn’t something I enjoy. One of my favorite herbs to steep fresh is peppermint, which has a green freshness that you don’t get from the dried herb. I take a handful of fresh peppermint from my garden, wash it, and steep it in boiling water for five minutes or so, often leaving the leaves in the pot while I enjoy the tea. But you can also make a lovely hot beverage from spices and roots, which often requires different handling. I generally make spiced teas by cracking the spices slightly and simmering them in water for 15 or so minutes to fully extract the flavor (also called a decoction). An example would be the tea I describe in this post. Simply steeping spices in hot water often doesn’t yield a strong enough flavor, although one of my favorite spice teas is thin slices of ginger root steeped in boiling water for upwards of 5-10 minutes (I just put ginger in a mug, add boiling water, and drink it grandpa-style, refilling as the ginger punch becomes too intense). Finally, you don’t have to steep your herbs and spices in water. My favorite nightcap is a mixture of lavender and chamomile, and it is particularly nice steeped in hot milk (or milk substitute) with a little dollop of honey. I don’t let the milk boil, but I bring it up to about 165 F and let it steep for a little bit before straining out the bits of herbs. Spices are also quite nice steeped in milk. NB: I am not a medical professional nor am I a professional herbalist and cannot give health advice concerning the use of herbs. All the teas I describe here are my personal blends and favorites and I encourage you to do your own research and find your own favorites. Hello, again! While I ended the main tea primer with Level Three’s superficial introduction to gong fu brewing, I thought I’d return with two “bonus level” techniques. While I’m not a tea expert by any means, I have had first-hand teaching in two specific traditional preparations of tea: Japanese matcha and Indian masala chai. So I thought I’d share a little bit about how I incorporate these techniques into my own tea practices when I want something a little different than just leaves steeped in water. Matcha is a type of ground green tea powder that is used in the traditional Japanese tea ceremony. The most authentic forms of matcha are made from tencha tea leaves that have been shaded for at least a few weeks to force the tea to concentrate some of its chemical constituents to produce a brighter green color and a richer umami flavor. It is made from a variety of green tea known as tencha. For more about traditional matcha production, I really like this overview from Ippodo. Because the processing leads to high concentrations of certain chemical constituents, matcha has gained a reputation as a health superfood in recent years. Unfortunately, that means that there is a lot of subpar matcha on the market being sold as a supplement. Matcha is also used in baking, lattes, and other recipes, which mutes subtle flavors, so typically “culinary grade” matcha is used for these purposes. While good culinary grade matcha is absolutely drinkable on its own, it does not compare to the experience of a really nice bowl of matcha, prepared traditionally. Personally, my favorite matcha comes from Ippodo. Since their products ship from Japan, the international shipping can be a bit steep, but if you buy a few different things, the value is still pretty good for the quality you’re getting. I tend to mention which specific matcha I’m drinking on my Instagram profile, usually for Matcha Monday. And I will use a good-quality matcha in a latte, mostly because I tend not to add much sweetener, so as to let the flavor of the matcha come through. But matcha is primarily known for being the tea used in the Japanese tea ceremony. I’m fortunate enough to live in a city where there is an active society for the preservation and teaching of the Japanese tea ceremony. 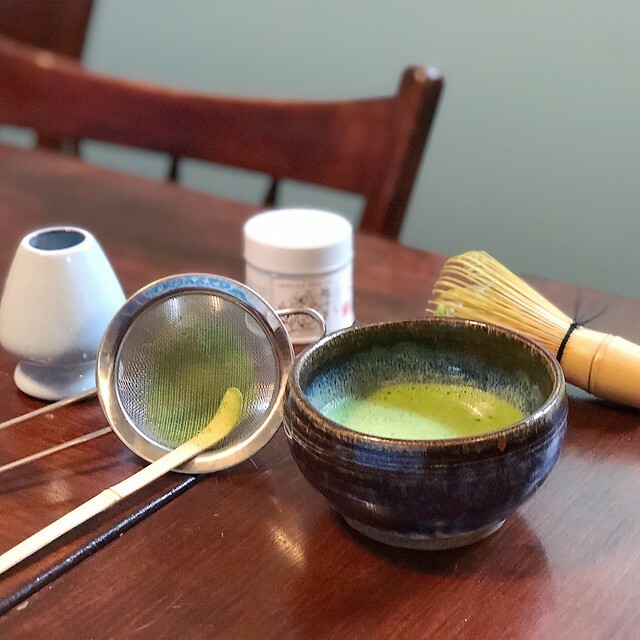 I visited the Washington DC Chado Urasenke Tankokai last year and chronicled my experience of a private demonstration and lesson in the Japanese tea ceremony, and I thought I’d share how this experience has informed my preparation of matcha. When I make a bowl of matcha at home, I don’t follow the whole tea ceremony. Obviously, the ceremony is an inherently social, service-oriented practice, so making a bowl of matcha for myself is not the same. But I do observe some of the procedures. First, I make sure to set out all my tools carefully before I begin. I heat my water, usually to 180 F because it will cool upon being poured out into another vessel. My first step is to pour some water into my chawan (or matcha bowl) and whisk it with my chasen (matcha whisk) a few times to moisten the whisk. Then, I empty the water from my bowl and wipe it with a cloth I use only for preparing and cleaning up after matcha. The next step is to measure out my matcha. Because I only sift matcha as needed, I place my sifter over my chawan and measure out two scoops of matcha with my chashaku (matcha scoop) and use the chashaku to gently push the matcha through the sifter. I remove the sifter and measure out two ounces of hot water in a separate cup. This, I pour over the matcha in the chawan and whisk. I whisk with a back-and-forth motion for about 15-30 seconds, until a nice froth has appeared. Then, I make a few slow circles to help break up larger bubbles. Now it is time to savor my matcha. I like to sit in silence and enjoy my matcha, focusing on it entirely. It is a small amount, so it doesn’t take a long time, but I do roll it around in my mouth and appreciate the complex flavors. Some matchas are quite umami, or savory, in flavor, while others have varying degrees of floral, tart, or vegetal flavors. Once I’ve finished my bowl of matcha, I clean up. This comes from my past Zen practice and the koan “Wash Your Bowl”. I take my empty matcha bowl back to the kettle, pour in some hot water, swish the whisk around in it to wash off the matcha, and then put it on the whisk stand to dry with the tines facing down so that water doesn’t run into the handle and mold. The stand also helps to keep the shape of the whisk. I empty out the chawan and wipe it with my cloth. I also wipe off the chashaku and sifter, after tapping off excess powder. Then, everything goes back into the tea cabinet. I never leave my matcha tools out, even though I’m rather bad about leaving out my other tea tools. In this way, making a bowl of matcha becomes a meditative activity as well as a morning beverage. I don’t know if it is the theanine in matcha that makes my mornings feel brighter and calmer, or if this small meditation puts me in a good frame of mind, but my mornings that start with matcha are almost always calmer and more productive. If you’re interested in learning more about traditional matcha, I highly recommend looking for a Chado society near you. And I give a list of matcha tools that I use on a regular basis in the information box below this video (which also shows my matcha preparation). When I was fresh out of graduate school and freshly divorced, I moved around a lot, often living in shared houses. In one of these houses, I lived with an Indian woman and her husband. Every morning, one of them would wake up early and make masala chai. Masala chai means “mixed-spice tea” (fun fact: “chai” just means “tea,” so the Western habit of referring to spiced tea as just “chai” is somewhat like the habit of calling a caffe latte a “latte,” which in Italy just refers to plain milk) and is a blend of black tea with various spices. According to my housemate, it is made and served at all hours of the day and her family is always up for tea. Traditionally, masala chai is often made by boiling spices and tea in milk, but my method involves preparing the tea with only water, since my housemate was lactose intolerant and would let everyone choose their own form of milk or milk substitute. So this is her method, which I quite enjoy. 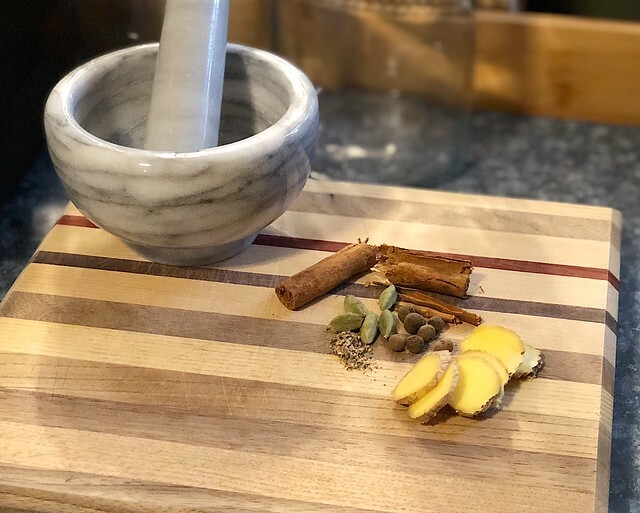 First, she would put a cinnamon stick, some cardamom pods, some black peppercorns, and maybe a couple cloves or allspice berries (I prefer allspice because cloves can easily overwhelm the other spices) in a mortar and pestle and hit them a few times just to crack the pepper, break up the cinnamon, and open the cardamom pods. These would go into a small saucepan, along with a few slices of fresh ginger. This would be covered with water and brought to a boil, and then simmered for at least fifteen minutes (sometimes it would simmer for longer, as the did other things to get ready for the day). Then, she would turn off the heat and add a couple spoonfuls of loose-leaf black tea. She used loose-leaf Tetley that her family would send her from India, but I generally recreate this with a loose-leaf Assam tea. This would steep for about five minutes, and then get strained into mugs. Each person can add milk and sweetener as desired. She liked almond milk and stevia, while I usually used whole milk and honey. A very traditional way to sweeten it would be to add jaggery, which is an Indian unrefined sugar, but as it comes in lumps, it generally has to be boiled with the spices to fully dissolve. The nice thing about masala chai is that it doesn’t require much in the way of fancy ingredients. I can get all the spices I use in the grocery store, and it generally works out well with any strong black tea. Inexpensive “English breakfast” tea blends often use strong Indian teas, so if you can’t find Assam, any English breakfast tea should work. 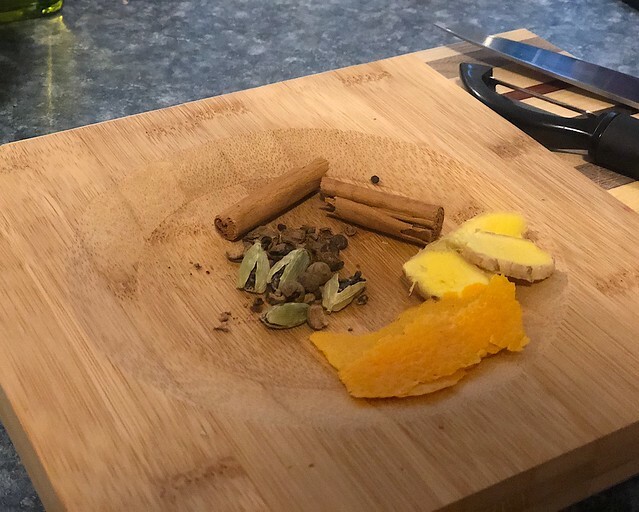 While the tools may seem daunting, I have made this tea by smashing my spices on a cutting board with a heavy jar (it remains my favorite use for coconut oil), rather than using a mortar and pestle, and if you have a tea infuser mug, you can use the infuser to strain the tea if you don’t have a small strainer. I will say that I’m not a fan of pre-blended loose-leaf masala chai. If I had to choose one, I would probably go with Rishi’s, because they use the most cardamom, which is my favorite, but I find that with pre-blended masala chai, you don’t get enough spice flavor before the tea is oversteeped and unpleasant. They’re nice in a pinch, but if I’m going to indulge, I do it properly by boiling the spices separately. So those are my two “bonus levels” of tea. Perhaps in the future, I’ll expand this primer, so let me know in the comments if there are more tea topics you’d like me to cover! NB: I have not been provided any incentive to mention any of the shops or products mentioned in this post. Now you’ve explored a bit of the world of higher-quality loose-leaf tea. You can make yourself a pretty nice mug of tea. Perhaps you’ve even bought a few different options for teaware, like a teapot and an infuser mug. And you’ve tried a few different kinds of teas. No big deal, but you want more. Well, this is where I want to talk about gong fu cha, or brewing based on the Chinese tea ceremony. Gong fu style brewing involves steeping a relatively large amount of tea leaf in a smaller amount of water for a series of short brews, rather than putting a small amount of leaf into a mug for a few minutes. It yields a tea session, rather than a cup of tea, and can be a wonderful way to really get to know a tea. Before we really get into this, I wanted to point out that I am in no way an expert on the Chinese tea ceremony, nor should this be considered a guide to really “authentic” or traditional gong fu brewing. For more information about the context and history of formal gong fu cha, you can check out this article or see if there is somewhere near you to experience a Chinese gong fu tea ceremony. It’s worth noting that, in China, most people brew their tea much less formally, either grandpa-style or in a modified grandpa-style by throwing tea leaves in a pot and letting them brew as they serve it, refilling with water as needed. Anyway, back to gong fu cha. The name means “tea with great skill” and it is, at its essence, a method of steeping tea with precision and control over the factors. This is the level at which I find it the most beneficial to consider adding things like a temperature-controlled kettle and a small scale for weighing tea. Yes, you could absolutely buy these things sooner, but if you want to have a good gong fu session, you’re definitely going to want to have more precise control over the temperature of your water and exactly how much tea you’re using. One note on the style of this level: I’m going to talk about the techniques and general equipment, and give a sort of “buyer’s guide” at the end, rather than interspersing vendor recommendations with the instructions. You can also check out my previous post about “Getting Started with Tea on Amazon Prime” for some recommendations on teaware that I use. So here are the basics: You take a small vessel, usually around 3-5 oz. (90-150ml) and fill it approximately ⅓ of the way with tea leaf, and then fill with water. You steep the tea for seconds, maybe 10-30 seconds at first, and then strain it into another vessel to serve. The steeping is repeated as many times as you get flavor out of the tea, typically adding on 10-15 seconds to each steeping. It is also not unusual to rinse the tea before the first steeping. Typically Chinese tea cups are much smaller than Western tea cups, sometimes only an ounce or two in volume, so a 150-ml teapot can yield tea for more than one person (or you can drink the whole thing yourself). It is important to note the difference in vessel size so that you’re not surprised by the size of your teaware when it arrives. When my husband bought me a 60-ml teapot recently, he thought he’d been sent the wrong thing at first when he saw how absolutely tiny it was. Yes, it’s supposed to be that small — you’re brewing a tea session, not a single cuppa to linger over. The essential tools for gong fu brewing are a vessel for steeping and a vessel for drinking. The classic example of a steeping vessel is the gaiwan. This is a small cup, usually made of clay or glass, that has a cover. The cover helps keep volatile oils from evaporating during steeping, and also serves as a way to strain leaves out of the tea when you move it from the steeping vessel to the drinking vessel. The drinking vessel can be anything, although if you have quite a small brewing vessel, straining into a large mug can look and feel a bit silly. That said, I routinely use a gaiwan for steeping and strain it into an English tea cup. From there, you can add elements to make your tea brewing experience more refined. Some people like to strain their tea more than the lid of a gaiwan allows, and use a mesh strainer over their drinking or serving vessel. Some prefer to strain into a serving pitcher and move it to drinking cups from there (this is particularly useful when your cup is slightly smaller than your brewing vessel). And going further, in the most formal tea ceremonies, tools such as picks, scoops, and tongs are used to handle the tea and teaware to avoid the oils and dirt from your hands from contaminating the tea. Finally, since gong fu brewing can involve a fair amount of spilling and discarding liquid, some people choose to use a tea tray with a draining base so they can simply pour the liquid through. Personally, I either use a discard vessel, or else brew outside on my wooden deck, which acts as a sort of giant tea tray. Additionally, not all gong fu brewing has to be done in a gaiwan. There are also small Chinese teapots that can serve as a brewing vessel. While glazed porcelain is common, some pots are unglazed and made of materials like clay or silver, which are thought to alter the taste of the tea in interesting ways. Unglazed clay can also supposedly pick up a kind of season, and when used for one tea or one type of tea, and impart complexity and additional flavor as they take on more of that kind of tea. Personally, I have two teapots that are unglazed on the inside, one for oolongs (particularly bug-bitten “honey” oolongs) and one for ripe pu-erh, but I generally brew in glass or glazed porcelain so that I don’t have any concerns about using any teaware for any tea in my cupboard. Alright, so let’s imagine that you’ve just received your first gaiwan. Time to brew some tea, right? Not so fast. I highly recommend you practice moving liquid into and out of your gaiwan, without the pressure of actually steeping a cup of tea (and the hazard of hot water). There is a bit of a learning curve with gaiwan brewing, and I had my fair share of spilled tea and burned fingers when I started out. Indeed, even after years of practice, I have bad days where I just can’t seem to strain from the gaiwan properly. This will also give you the chance to get an idea while gaiwan “hold” you like best. The trick is to be able to hold the edge of the pot and keep a finger on the lid to keep it from falling off, all with one hand. 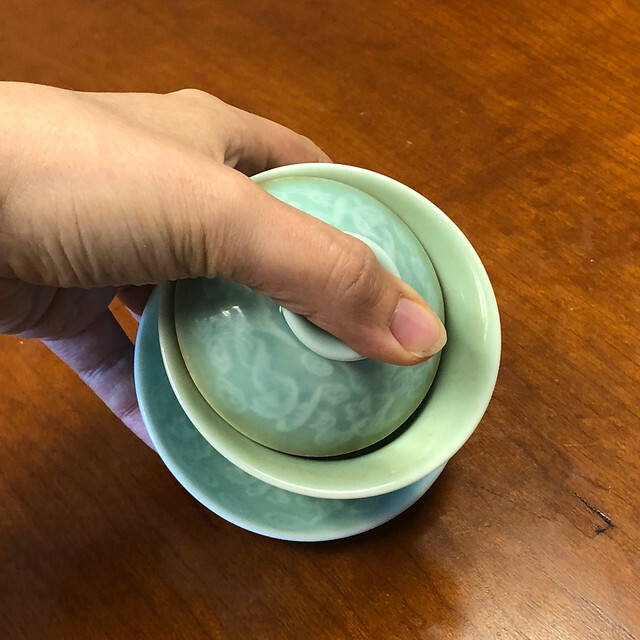 The two basic holds are holding the edges of the bowl with your thumb and middle finger, while keeping your index finger on the lid, or holding the whole thing (with saucer, if you have one) in your hand, while keeping your thumb on the lid. These holds are demonstrated in the photos below. Finally, now can we brew some tea? Okay, you’ll want to start by determining how much tea you need and how hot to heat your water. Again, the amount of tea, the temperature, and the steeping time are all things you can play around with to get your favorite iteration of a particular tea, but I find that a good starting point for amount of tea is to use approximate 1-1.5 g of tea per ounce (30 ml) of water. So for a 150-ml gaiwan, you would use about 5-8 g of tea (for reference, the typical tea bag contains about 2 g of tea, which makes an entire mug, so this is a lot of tea for a small amount of water). Water temperature will vary by tea type, and generally it’s good to start brewing black teas at 200-212 F (95-100 C), oolongs at 180-200 F (80-95 C), greens at 160-180 F (70-80 C), and white teas at 180-195 F (80-90 C). Ripe pu-erh teas can handle boiling water, while raw pu-erh teas benefit from being treated a bit more gently and may prefer water at 195 F (90 C). From there, you can follow the troubleshooting in previous levels to adjust water temperature (or tea amount). The steeping method is often called “flash infusion” as the tea is brewed for a very short time. It’s usual to give the tea a rinse, particularly for rolled or compressed teas. The rinse gives the dry tea a chance to take on some water and start to open up, and in the case of aged teas, can help rinse off any dust that may have settled. To rinse the tea, pour some hot water over it in the brewing vessel, swirl it once or twice, and strain it into your other vessels. I like to use this rinse to warm the teaware. Then, discard the rinse (or taste it, if you want). Once you’ve rinsed your tea, it’s time to start steeping. Start with 5-30 seconds. It sounds like an absurdly short amount of time, but it really does give you a fuller picture of how the tea opens up. I like to stick to this guideline the first time I try any particular tea. 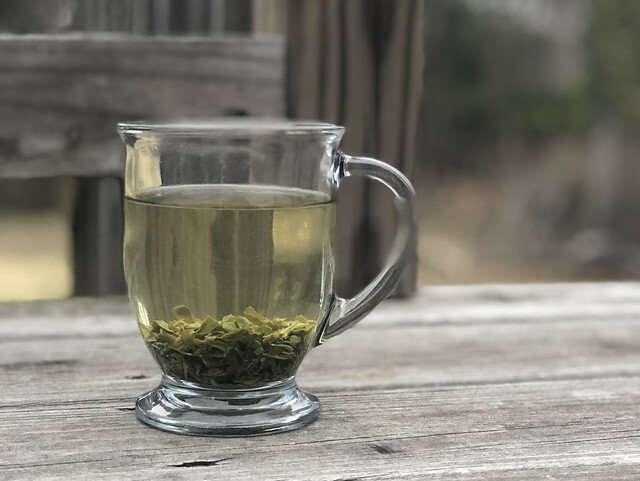 For black teas and pu-erhs, I definitely stick to the 5-10 seconds for a first steeping, but for green and white teas, I usually extend the first steeping to 20 seconds, and for rolled oolongs, I start with a 30-second first steeping. It is a bit frantic, particularly if you haven’t perfected your gaiwan hold, but do the best you can to steep it and strain it quickly. Then, taste the tea. This isn’t tea to gulp. You’re brewing this way to get to know the tea, so take your time. Smell it. Write things down. Write down exactly how you steeped your tea and how it turned out. Then, repeat, adding 5-10 seconds onto each subsequent brewing. The flashest of flash steeping sessions is the method recommended by the company White2Tea, where you rinse, and then steep the tea for 5 seconds, 10 seconds, 15 seconds, and so on, for up to ten steepings. Personally, I tend to start with 10 seconds for a first steeping because I don’t often find a tea where that first 5-second steeping doesn’t just taste like a second rinse. As you take notes, you can experiment with brewing parameters. Some teas want to be pushed. Some teas release a lot of flavors quickly and could be pulled back with a shorter steeping. I’ve actually salvaged some green teas that I thought were unpalatable at first by cooling off the water and steeping for shorter times at first. Play around with it, but write things down, so you can repeat the sessions you enjoy. Alright, now I want to talk a little bit about where to buy your teaware for gong fu brewing. While I’ve mentioned my Amazon post, I don’t actually prefer to buy most things from Amazon. The two things that can definitely come from somewhere like Amazon or Target are an electric kettle and a digital scale. I prefer a scale that is precise to at least 0.1g (both of mine are precise to 0.01g), so that I don’t have to worry about the precision of the scale affecting my steepings. I have this one at home and this one in my office. Kettles are a whole different rabbit-hole. Personally, I’ve never bought a fancy gooseneck kettle, though I can see how the control could be helpful with filling smaller teaware. But I’ve used the Chefman programmable kettle my husband bought me for Christmas for the last couple of years. Before that, I think I just picked something up from Target. But any decently-rated kettle that allows you to control the temperature to within 10 degrees Fahrenheit should work fine. It’ll probably run you at least $25-50. Okay, now onto the fun stuff. 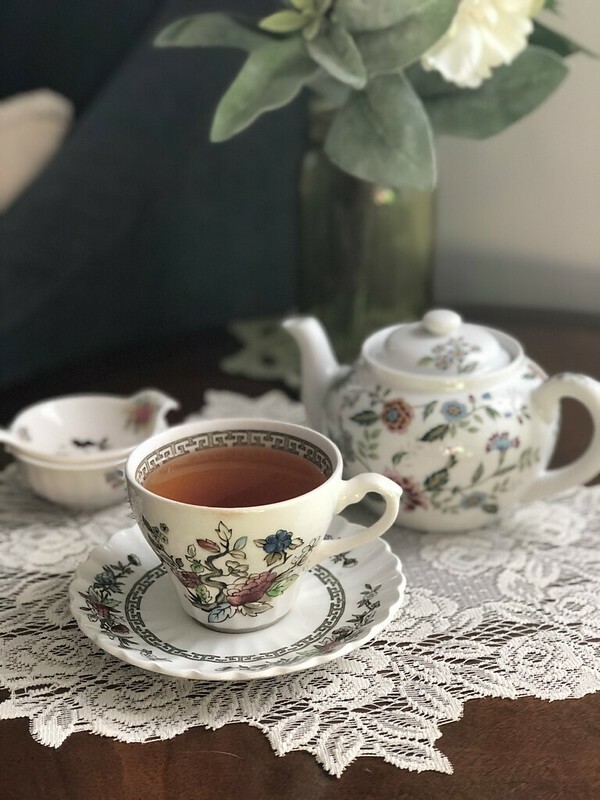 The thing about teaware is that there is just such a wide array of beautifully-crafted things that you can use to make tea. You can choose to get matching pieces or sets, or you can pick and choose and put together an eclectic collection. I can’t get into all the artists that I’ve patronized over the years here, so definitely check out my YouTube channel to see my teaware collection in action. But a good starting point is Teaware.House and Yunnan Sourcing. Both have a large variety of teaware at a variety of price points, and tend to be very up front about the volume of the pieces they sell, so you can put together a set that works for you. I would recommend starting with at least a gaiwan and a cup that is approximately the same volume as the gaiwan (or a gaiwan, a pitcher, and a smaller cup). A good starter gaiwan size is 100-150 ml. 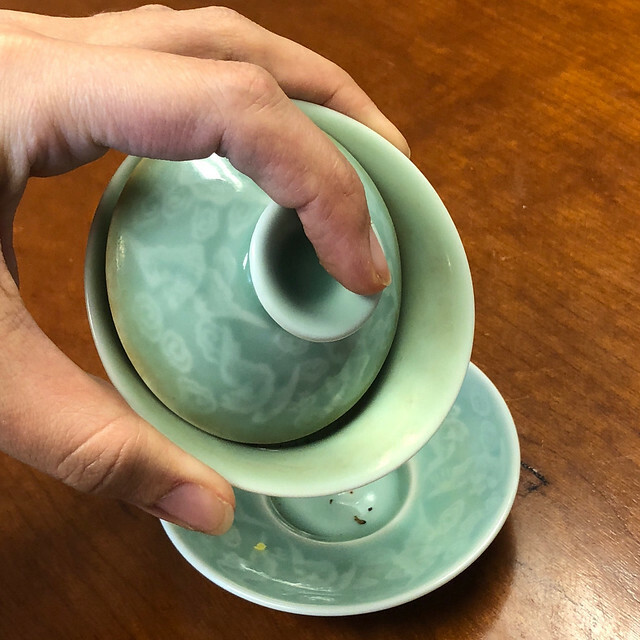 A smaller gaiwan will allow you to experiment more while using less tea, while a larger gaiwan will allow you to get a little more tea out of a single steeping and perhaps give you the chance to linger over each cup a big more. You can also start with a “travel” or “easy” gaiwan set, which fits together so that the cup is like a lid for the gaiwan. This incorporates the two essential items of gong fu brewing into one set and is very convenient. If you’re picky about leaf debris getting into your cup, you can also pick up a strainer (though I rarely use one), and if you’re serious about gong fu cha, there are further tools that you can check out in the article I linked earlier about the traditional method. As far as sourcing teas, there are some good resources in Level Two, but here is where I would suggest checking out one of the more daunting tea sellers, like Yunnan Sourcing, or their sister site Taiwan Sourcing, for Taiwanese oolongs. I find that gong fu style brewing works particularly well with Chinese and Taiwanese tea, probably because the brewing techniques originated with those cultures. 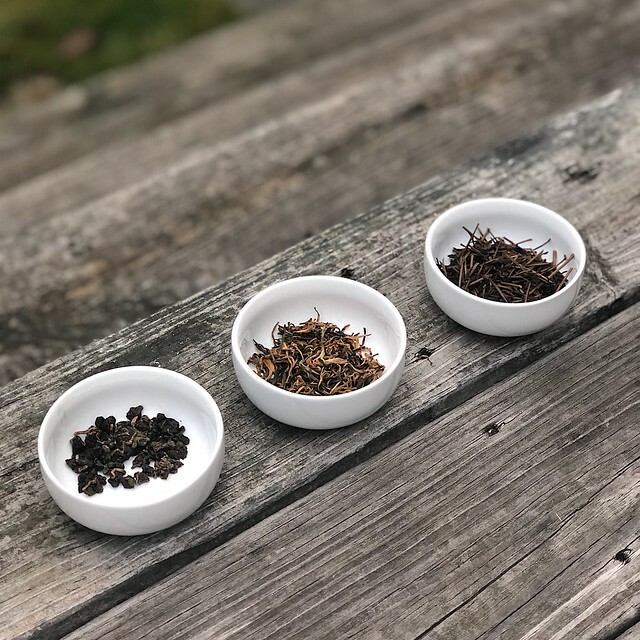 If you want to dive into the pu-erh rabbit hole, Yunnan Sourcing has a huge variety, but I also have enjoyed what I’ve gotten from White2Tea. They also sell other types of tea, which I’ve tried and reviewed in the past. One note: Yunnan Sourcing in particular can be incredibly intimidating to order from. If you don’t have a tea style in mind, or you’re not the kind of person to just try things blindly, try one of their samplers or contact Scott. He’s extremely nice and helpful and pretty responsive over email and Instagram DM. He also has a great YouTube channel where he posts videos of himself and his wife (and guests) tasting and discussing various teas that they sell. Once you’ve bought your first gaiwan and started experimenting with gong fu brewing, it will probably be a matter of time before you’ve developed a bit of a collection of both tea and teaware. So perhaps, also consider thinking about getting a new cabinet to store your newfound hobby tools in. But that is a discussion for another time. There is so much more to say about the world of tea, but I will leave this guide there and allow you to explore from there. Gong fu cha (“Tea with great skill”) is based on the Chinese tea ceremony and involves the precise brewing of tea. A larger volume of tea is steeped in a smaller vessel for a shorter amount of time, and resteeped to experience how the tea changes over time. You need a steeping vessel and a drinking vessel, though further elements can come in handy. This is also the point at which you want to consider getting a digital scale and a programmable kettle. Chinese teaware is much smaller than Western teaware, with brewing vessels being around 100-200 ml. The classic brewing vessel of gong fu cha is the gaiwan, which is usually around 100-150 ml. Practice handling your gaiwan before you add hot water to the equation. Start with 1-1.5 g of tea leaves per 30 ml of water. Start with water temperatures of: 200-212 F for black tea, 180-200 F for oolong tea, 160-180 F for green tea, 180-195 F for white tea, 212 F for ripe pu-erh and 195 F for raw pu-erh. Rinse the tea and then steep for 5-30 seconds at first, then increase each subsequent steeping by 5-10 seconds. Steep until you stop enjoying the tea, sometimes as much as 10 times. Take notes on how you prepared the tea and what the result was for each tea session. To start your tea collection, take a look at Teaware House and Yunnan Sourcing for a variety of Chinese teaware at different price points. NB: All vendors mentioned in this post are vendors that I have used and liked, and I have received no compensation for recommending them. Alright, so perhaps you have an idea about tea. Maybe someone bought you loose-leaf tea, either as a gift or maybe as a souvenir. Or perhaps you’re just ready to move up in the world (I kid). Well, making the leap to loose-leaf tea is a big step in the tea world. You’re no longer clinging to the convenience of tea bags and you now have not only a whole world of new teas you can try that simply aren’t available bagged, but you also have choices to make concerning tea ware. At this level, I’m still going to stick to Western-style brewing, but you’ll be able to have a bit of fun with your tea ware. First of all, nothing really changes about the type of tea you can brew. The main categories are black, green, white, oolong, and pu-erh. But because different varieties of tea are often not sold in bagged form, you have a world of new varieties open to you. Tea is grown primarily in Asia, with some grown in Africa, and North and South America. Most of my favorite teas come from Asia (although one of my favorite black teas comes from Tanzania). For the novice starting out, I would recommend trying black teas from India, Africa, and China; green teas from China and Japan; and oolongs from China and Taiwan. Pu-erh is a tricky category because, technically, all pu-erh comes from Yunnan province in China, though other regions make teas processed in the same way. When trying black teas, the classic black teas are Darjeeling, Assam, and Ceylon from India and Sri Lanka, as well as Keemun from China. I also am quite partial to Dian Hong from China. For green teas, I recommend trying Long Jing and Mao Feng from China and Sencha from Japan. Oolongs are a rich and varied category of tea, but if I had to narrow it down, I’d say that Tieguanyin and Wuyi oolongs from China, as well as Dong Ding and Alishan oolongs from Taiwan are a good place to start. For white tea, my first white tea was Silver Needle. There is some disagreement about whether or not this is a good starter white tea, but I quite liked it. Pu-erh is quite a more daunting category of tea, and honestly, I find most pu-erhs are more suited to Chinese-style brewing, which I’m saving for the next level. But where do I get these teas? Well, one of my favorite places to look for all different types of tea from around the world is a company called What-Cha Tea. They’re based in the UK, but shipping to the US isn’t terrible. And they have one of the most generous minimums for free international shipping. They offer tea from all over, though the variety can be daunting. But I’ve loved everything I’ve gotten from them, and in fact, that’s where I got my very first white tea (and how I fell in love with white tea). Another place for the new tea-drinker to get Chinese teas is Teavivre, which I featured in part two of my guide to getting started with tea available on Amazon, because they have a number of teas available on Amazon Prime. For Taiwanese teas, I also really love the Beautiful Taiwan Tea Company. And Rishi Tea has some good loose-leaf offerings, particularly if you can find them in your local grocery store. For Indian and African black teas, I also like Harney & Sons. Now, let’s talk equipment. 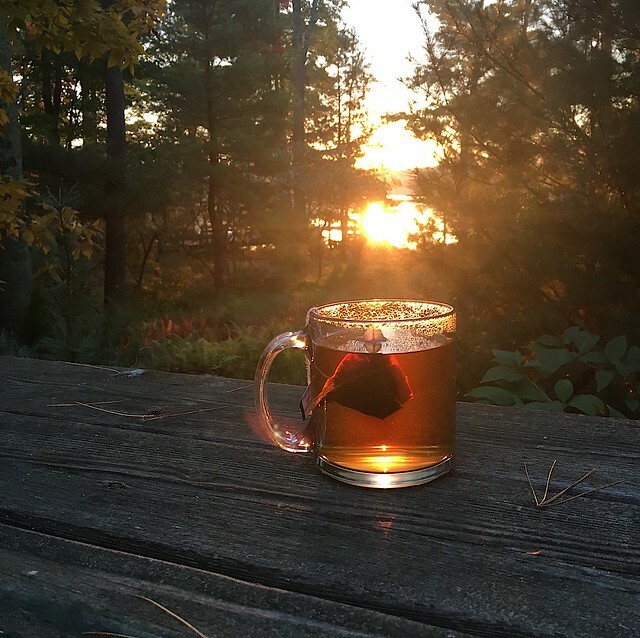 The simplest way to brew loose-leaf tea would be something that has come to be called “Grandpa style” among Western tea enthusiasts, a term coined by blogger MarshalN to describe how his grandfather drank tea. This is also how a lot of my Chinese and Korean colleagues over the years have drunk their tea. I’ve talked about it before, but simply, you put the tea in the bottom of a large mug and add hot water, and then drink the tea with the leaves still in it, adding more water as the tea gets too strong. Obviously, this will not work for all kinds of teas, and I’ve found it best suited to certain oolongs and very delicate green teas that don’t oversteep easily. I’ve never tried it with pu-erh, personally, but I’ve heard good things. The benefits are that you don’t need much in the way of equipment — just a mug — but the drawbacks include the fact that it can be a bit odd to drink your tea with the leaves still in it. So what if you want to strain the leaves out of your tea? Some people like to use something like a “tea ball,” which is basically like a refillable metal tea bag that you fill with a little tea and dip into the tea to steep. Personally, I find that these don’t really allow the tea enough room to expand and move around in the water and prefer a larger, basket-style infuser. My number one recommendation for a first loose-leaf infuser mug is the FORLIFE Tall Curve Mug. It has a nice big basket, and the lid doubles as a coaster for your infuser so you can keep it close for a second (and third and fourth…) steeping. I started out with a FORLIFE Asian-style Curve mug and and switched to the Tall Curve mug because I found the handle-less design got a bit hot for my hands. I used Curve mugs for years, though, before I ever got any of my fancier teaware. If you’d rather steep your tea in your favorite mug, FORLIFE also offers just an infuser that can sit in basically any mug. Okay, but what if I really want to brew my tea in a teapot and pour it into a dainty cup and saucer for sipping? Well, something like the FORLIFE Stump or Curve teapots is nice, depending on how much tea you want to brew at a time. Remember, if you get a 24-oz. Teapot, you’re basically brewing 2 mugs (or 3-4 cups) of tea at a time. These have the benefit of having a removable brewing basket so you can brew the pot of tea, remove the tea leaves once it’s steeped, and then cover and keep the pot warm while you drink it. Something like a tea cozy is helpful for this, but in a pinch, a knit winter hat will work (in fact, my tea cozy is one that I made by modifying a hat pattern to include holes for the spout and handle). You can also get a teapot without an infuser and strain the tea into the cup using something like this over-cup strainer, but the drawback to that is that you can’t remove the tea leaves from the rest of the pot and later cups of tea will be stronger than the first. Personally, I deal with this when I use my vintage tea pots by refreshing my cup of tea before I’ve completely finished it, and then adding more water when the tea is just too strong, kind of like a modified version of grandpa-style brewing, actually. I find this works best with black teas that I also like to drink with some milk or sugar because I can add more milk as the tea becomes too strong, or else when I’m making tea for a large group and I know we’ll finish the whole pot at once when I serve everyone and can just re-brew for the next round. One last question remains: How much tea do I use? Well, at this point, I’m still trying to keep things away from being the most complicated they can be, so I’ll offer suggestions on measuring tea volumetrically. The standard “one teaspoon per cup” rule doesn’t really work if you have teas that are varying levels of fluffiness, but you can estimate. Basically, “one teaspoon per cup” tends to work best with Indian black teas like Darjeeling or Assam. They have smallish, curly, but not tightly-rolled leaves. If you’re using a fluffier tea, use more like two teaspoons per cup. And if you’re using a tightly-rolled tea, use a scant teaspoon per cup. And remember that if you’re using a big mug like the Curve, you probably want to consider that at least two cups. So, as an example, if I’m making myself a cup of standard black tea (perhaps the lovely Darjeeling blend from Harney & Sons) in my FORLIFE Curve mug, I would add about two teaspoons of tea leaves to the infuser in the mug, and then pour boiling water over it. I would let it steep for three minutes, and then remove the leaves, setting the infuser on the upside-down lid to serve as a coaster. After I’d finished my cup of tea, I could return the infuser to the mug, add more boiling water, and let it steep for four minutes this time before removing the leaves and enjoying another cup of tea. Our trouble-shooting techniques are largely the same, with one addition: If your tea is too weak, you can now also add more leaf. Adding more leaf will also give you a better shot at getting multiple infusions out of a tea. Personally, I like to use nearly a tablespoon of most tea leaves for a mug of tea. If I’m drinking a particularly fluffy tea, I’ll use a rounded tablespoon, and for tightly-rolled teas, I’ll use a scant tablespoon. It’s honestly amazing to see how much these tightly-rolled teas will expand over the course of a few steepings. And look at your tea — if it has hardly expanded or unrolled at all after the first steeping, you can still get plenty more goodness out of it. A tea shouldn’t be spent until you can see that it has fully expanded into an almost-fresh-looking tea leaf. If you opt for loose-leaf tea, you have a world of varieties open to you! Try some of everything. 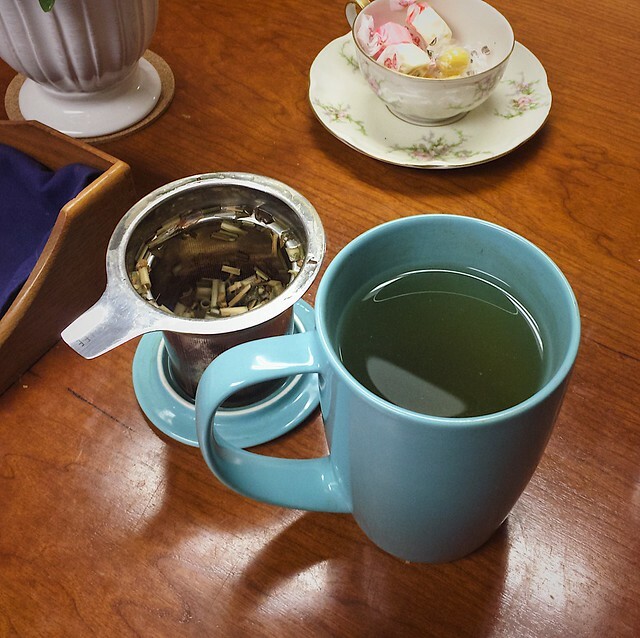 If you don’t mind sometimes eating a leaf, you can brew your loose leaf tea grandpa-style. If you want an infuser, a good choice is a mug with an infuser basket, like the FORLIFE Curve mug. If you definitely want a teapot, a teapot with an infuser basket, like the FORLIFE Stump teapot will be easy to use. Start with about one teaspoon of tea leaves per cup of water, adding more volume if you’re using fluffier tea and less if you’re using tightly-rolled tea. Remember that a large mug or teapot counts as two cups and adjust tea leaf amount accordingly. Now you can troubleshoot your tea by adjusting how much leaf you use, in addition to the methods in Level One. I want to start this section off by saying that there is not necessarily anything wrong with supermarket tea bags. I will even make myself a cuppa from a standard tea bag every now and then (usually when traveling). If what you’re after is a strong brew that can stand up to plenty of milk and sugar, standard tea bags might be the best thing for you. But they do not contain the best quality tea. And paying more for “fancy” tea bags is often not worth the money. Generally, tea bags are filled with what are called “fannings.” In order to understand what these are and why they aren’t great, it’s necessary to explain a little about tea grading. In the British system of tea grading, teas are graded by leaf size and whole-ness. So basically, leaves are placed in a series of progressively finer sieves, where the larger full leaves sit at the top and the smaller leaves and broken bits fall to lower levels. At the bottom of this hierarchy are the fannings and dust, which are the lowest size grade of tea. Now, none of this takes into account the initial quality of the leaves being sorted, but in general, larger, whole leaves behave differently in water than more broken leaves, and these fannings are the lowest grade of that. When tea leaves are broken up, the brewer begins to sacrifice control over the brewing process because more leaf surface is exposed to water, making flavorful compounds come out into the water faster. The problem comes because not all flavorful compounds are full of good flavors, and when you brew fannings, you will extract the less pleasant flavors with the good flavors more quickly. This can lead to an unpleasantly bitter or tannic cup of tea that is best covered with some dairy and sugar. These unpleasant flavors can also overpower the more delicate flavors in the tea. So I’ve convinced you that tea bags are the worst and you want to stop using them. Well, not so fast. Most commercial tea bags sold in the supermarket are full of fannings and dust and don’t really exhibit much flavor nuance unless they have other flavorings added. But not all of them are so. And I recognize that not everyone wants to jump right into loose-leaf tea. This is where full-leaf tea bags come in. These are tea bags, yes, but they are filled with higher-quality, whole tea leaves. Sometimes called “sachets” to differentiate them from standard tea bags, they are often made in a pyramid shape, so that the tea leaves have more room to expand as you steep them and they swell in the water, allowing for a better extraction of flavor without sacrificing control over the steep by breaking up the leaves. One of my favorite brand of full-leaf tea bags is Rishi Tea. I purchased these to serve at my wedding and it’s what I carry with me when I travel. They have a nice variety of teas and herbals available in pyramid-shaped bags, and can give the tea novice a nice introduction to the world of teas, though most of their bagged teas are flavored in some way. That said, they have one type of unflavored black tea and two types of standard, unflavored green tea available in sachets (plus their Matcha Gyokuro, which might be a bit odd for a novice tea-drinker – I’ll talk more about matcha in a future post!). Another brand that offers tea bags is Harney & Sons. Again, many of their bagged offerings are flavored, but they have a decent selection of pure teas, for those just getting started. I also like Mighty Leaf Tea sachets, which are large but not pyramid-shaped. They offer a hojicha roasted Japanese green tea in a bag that would be great to try, particularly if you’re a fan of roasted flavors. Additionally, Teatulia offers a variety of bagged whole-leaf teas, including unflavored offerings of black, white, green, and oolong teas. If you’re keen to try pu-erh tea and want to stick with bags, Teavivre offers bagged pu-erh teas. They offer a plain ripe (shu) and raw (sheng) pu-erh, as well as varieties flavored with rose, chrysanthemum, or rice. For more variety of oolong teas, my friend Nazanin of Tea Thoughts found some high-quality bagged oolong tea from Esteemed Tea Co. for her “Steep It Real” tea gift box. One thing to note with these oolong teas is that they are all unflavored and the “honey” oolong refers to the natural honey aroma that occurs in some types of oolong tea. Of course, you may want to try some of those flavored teas. I would highly recommend you start with more traditional flavorings and leave the blueberry-vanilla-mango tea for a bit later on in your tea explorations. Traditional flavorings are things like Earl Grey, which is a good black tea scented with bergamot, or masala chai, an Indian blend of black tea with spices like cinnamon, cardamom, black pepper, and ginger. For green teas, I like jasmine green tea, though it can be difficult to find a tea that isn’t cloyingly floral-scented. Other classic flavorings for teas are rice (such as in genmaicha green tea, which is often served in sushi restaurants) and chrysanthemum. For my wedding, since they are generally crowd-pleasing, I served Earl Grey and Jasmine Green teas from Rishi Teas. But it is a good idea to get a variety of pure, unflavored teas to get an idea of what the teas themselves taste like. Now that you have the tea bags, what do you do with them? Well, in order to make tea, you need tea leaves and water. In most cases, people generally prefer to have some way of removing the tea leaves from the water after the tea is brewed. In the case of a tea bag, the removal of leaves is trivial, so all you need is a cup of some sort in which to brew your tea, along with water of the appropriate temperature. Ah, temperature. The perpetual question and battle of the tea novice vs. the tea master. You may ask, is the temperature of the water really that important? The answer is yes and no. Basically, tea comes with certain brewing instructions that tend to vary by the type of tea (although plenty of brands use the same instructions on the packaging of all of their teas). But these instructions are not rules. I like to say that brewing instructions are like the pirate’s code: they’re really more like guidelines. So with bagged tea, the things you can control are the tea bags you choose, how much water you put in, the temperature of the water, and how long you leave the tea in the water. All of these will affect your final brew, although it’s not always about better or worse. I think the first rule of tea is to make tea the way you like it. If you follow the instructions to the letter and you don’t like the result, try something a bit different. One of the main questions I get asked is how I know what temperature at which to brew the tea. The short answer is that it depends on the tea. The longer answer is that more robust, oxidized teas tend to like hotter water, while more delicate, less-oxidized teas like cooler water. But, like all of these guidelines, they’re not set in stone. And you can fine-tune a tea by playing with water temperature alone a lot. Cooler water will extract the flavors more gently, and I’ve actually found that steeping a black tea that tends towards bitterness in a slightly cooler water will yield a smoother brew. Okay, but what are the starting points? Well, black tea and ripe pu-erhs like full boiling water. Green and white teas will want water that is considerably cooled off from boiling, and oolongs will fall somewhere in the middle. After trying a tea at a given temperature, if the tea feels harsh, I’ll drop the temperature. If I feel I haven’t gotten enough flavor out of it, even after a long steeping, I might try hotter water. In the case of green teas in particular, sometimes too-hot water will yield a tea that tastes quite a bit of bitter, boiled spinach. Dropping the water temperature even more often helps. One thing that can be helpful to remember, if you’re watching your water boil, is this rough correspondence between temperature and bubble size in water. But what exact temperature do you mean? Well, at this first level, I would say that precision might not be that important. In fact, when I first started out, I didn’t have a temperature-controlled kettle. I would boil my water and let it cool off to get under-boiling water. I would set a timer and let the water cool off for a bit, and if the resulting tea tasted off, I would let it cool off more next time. It’s imprecise, but for the new tea-drinker, just letting the water cool off from boiling, rather than chucking boiling water over your most delicate teas will already be an improvement. The other part of the equation is how long your tea steeps. This will vary by the steeping method, but for tea bags, I’m assuming brewing will be done “Western-style,” which involves a relatively small amount of leaf brewed in a large-ish (8-12 oz.) vessel for minutes, rather than tens of second (oh, stay tuned for later posts for that). From there, try brewing your black teas for 3-5 minutes, your green and white teas for 2-4 minutes, and your oolongs for 3-4 minutes. Ripe pu-erh can go for five minutes or more because good pu-erh stays silky smooth even with the longest brew time and bad pu-erh will be horrible no matter what you do with it. Again, if something seems off, fiddle with the brewing time. Longer brewing times will yield stronger flavors and shorter brewing times will mellow odd flavors. One final note about good-quality, full-leaf tea: It can and should be brewed more than once. Remember how I said that whole leaves allow flavors to be released over time? Well, that can mean even longer than a single brew. I always brew my full-leaf tea at least twice, with the second steeping getting 30 seconds to a minute longer than the first, for Western-style brewing. So save your tea bag in a little dish and make a second cup of tea with it when you’ve finished the first. You can even try brewing it again and again, until you feel you’ve gotten all the flavor out! So if you’re the type of person who drinks a few cups of tea per day, you might be able to get away with one tea bag for the whole day, which will help soften the blow of the cost of good-quality tea a bit. Switch from standard, dust-filled tea bags to full-leaf tea bags. Some places to check out are: Rishi Tea, Teatulia, Esteemed Tea, Teavivre, Mighty Leaf, and Harney & Sons. Pay attention to the temperature of your water, but remember that “brewing instructions” are just guidelines. Start with boiling water for black tea, and then less-boiling water for oolong tea, and even less-boiling water for green and white tea. You don’t necessarily need to know the exact temperature, but remember how you heated your water so you can experiment if needed (or so you can reproduce a good brew later!). If you’re brewing your tea in a mug, start with 3-5 minutes for black tea, 2-4 minutes for green tea, and 3-4 minutes for oolong. If your tea is too weak, try hotter water or a longer brewing time. If the tea is too strong or tastes off, try cooler water or a shorter brewing time. You can brew your full-leaf tea more than once! Add on some time for each subsequent brew. Above all, make tea the way you like it! NB: All vendors mentioned in this post are vendors that I have used and liked, or that come recommended by those I trust, and I have received no compensation for recommending them. I think my ultimate goal with this piece is to end up drawing in readers who google “How to tea?” or “How do I even tea?” or “What to do with this tea?” As someone who has been drinking tea in various forms for at least thirty of my thirty-five years, I’ve had a varied evolution to the gong fu-brewing, matcha-whisking tea enthusiast who graces the pages of this blog. And many people in my life and who read my blog simply aren’t interested in the nuances of sheng vs. shu pu-erh or the terroir of oolong tea. Many of them just want to try something nicer than Lipton’s tea bags, or want to know what to do with this loose-leaf tea their friend gave them, or want to know what they really need to get started trying better-quality teas. A note about motivation: If you’re here because you want to switch from a different source of caffeine to tea because you think it’s somehow healthier, this is probably not the place for you. I can’t teach you how to enjoy tea, and I can’t speak to any particular health benefit of tea over coffee. I personally made the switch from drinking primarily coffee to drinking almost exclusively tea, but I had been enjoying tea for decades before that. I merely made the cost-benefit analysis for my own personal body. I actually love coffee, but it doesn’t love me back, so I limit it to once a week (unless I am in Europe, in which case, I suffer the consequences with wild abandon). And I feel absolutely no deprivation because I also love tea. But if you’re here to find out how to dip your toe into the tea, I hope you find this helpful. This primer will be organized into layers of tea enthusiasm, from least to more complex (I don’t claim to be a tea expert and couldn’t possibly write about the most complex layers of tea). I’ll start out talking a little bit about tea and what it is, though this will hardly be an exhaustive education. 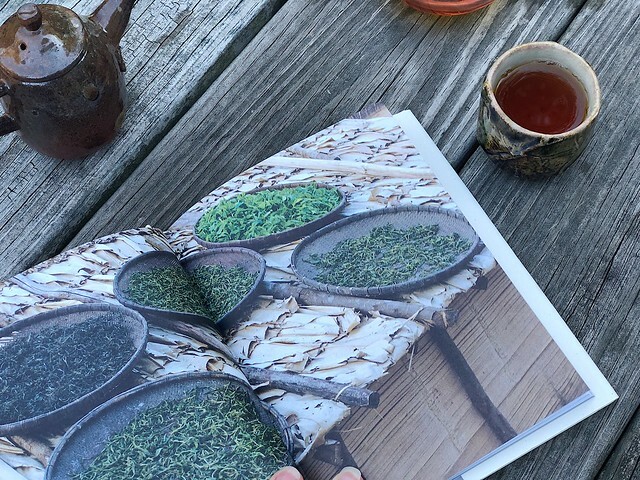 If you’re interested in more about the processing that goes into making the different types of tea, I highly recommend A Little Tea Book, or else check out Sebastian’s website, In Pursuit of Tea, where he offers a brief description of tea types in his “Tea 101” section. Okay, so. Tea. 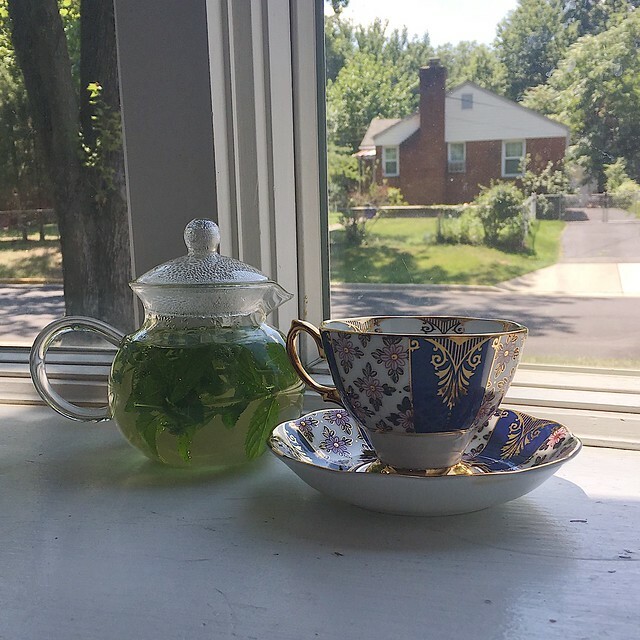 The first thing is that, while “tea” can colloquially mean the infusion of pretty much any plant matter in water, what I mean when I say “tea” is an infusion of the leaves, buds, and/or twigs of the Camellia sinensis plant. True “tea” comes from one species of plant, which is why I generally refer to herbal brews as “infusions” or “tisanes.” I love my herbal infusions as well, but they are not tea, to my mind. So with that in mind, what follows is a guide to the levels of enjoyment of Camellia sinensis. Despite only coming from one species of plant, tea comes in many different types. Most westerners are familiar with “black tea,” which is made with tea leaves that have been completely oxidized before being heated to stop this process. That said, green tea, which is heated to stop the oxidation process before being dried, has also gained popularity in recent years. Additionally, white tea has also appeared on the mainstream tea scene in the US recently. White teas are only dried and are not heated at all after harvesting. Rounding out the main types of tea are oolong tea, which is oxidized to some extent, and pu-erh tea, which are aged or fermented. Much of a tea’s flavor profile will come from its processing. Black teas are often described as richer, fuller-bodied, with flavors of tannin, malt, and dried fruits. Green teas are generally more delicate, with flavors of green vegetables or grass, while white teas can be intensely floral, belying their light colored brew. Oolongs have a wide variation, because “oolong” can describe a wide variety of processing techniques, and can range from creamy “milk” oolongs to floral-honey bug-bitten oolongs to cannabis-y roasted oolongs. Finally, pu-erh comes in raw or ripe and can range in flavor from similar to white teas to redolent of damp earth and mushrooms. When choosing starter teas, you’ll want to consider price, convenience, availability, and your own personal tastes. If you like really funky Islay whisky, consider giving ripe or shu pu-erh a try (despite the fact that a colleague of mine refers to it as “shoe” tea because of the aroma of earth and leather). If you’re a green juice fanatic, you might prefer to start with green teas, and if you’re a staunch traditionalist, the world of available black teas is hardly basic. Personally, I came late to the oolong and white tea games, so I tend not to think of them as starter teas, though they absolutely could be. The trick is to find decent examples of them for a reasonable price and without having to look too hard. Before we begin, I want to say something about how I’m setting this up. I’m calling the various chapters of this primer “levels,” but not as a way of denoting superiority. It’s more like the levels in a dungeon-crawling game. Just because you’ve “passed” one level doesn’t mean you can’t revisit it. And you should feel free to spend as much time on any given level as you’d like. Don’t worry about being a completionist. From there, the main question is: Now what do I do with these dried leaves? And that, gentle reader, is where we begin. I’m not a pumpkin-spice latte kind of person, but one spiced offering I do love is pumpkin bread. When I was in college, my favorite afternoon snack was a thick slice of pumpkin bread with a little pot of cream cheese to spread on it from the cafe in the library. 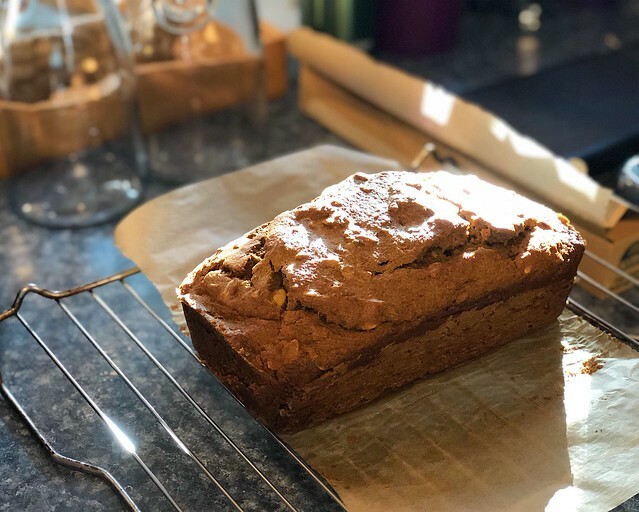 During the years I lived alone, I would often make a trip up to the library for a cup of tea and a slice of pumpkin bread during exams, simply because I would otherwise not interact with another person for days on end. So with the turning of the seasons, I felt it was time to bake a pumpkin bread to enjoy with my tea. I like mine with cream cheese. This is a very lightly-sweet bread, so if you prefer a sweeter snack, perhaps pair it with a sweetened cream cheese (beat a few tablespoons of maple syrup or honey into eight ounces of cream cheese for a sweeter spread). But I like it barely sweet, made with hearty whole-grain flours, and studded with pumpkin seeds instead of nuts. Preheat oven to 325 degrees and grease a loaf pan and line with parchment (I used an 8.5″x4.5″ pan). Whisk together the dry ingredients: flours, spices, baking soda, and salt. Whisk together the eggs and maple syrup until well-mixed, then add the pumpkin puree and mix well. Drizzle in the melted ghee while whisking to emulsify. Add the wet mixture to the dry mixture, along with a 1/4 cup of water, and stir together. Fold in the pumpkin seeds. Spread the mixture in the prepared pan and bake for 60-75 minutes, until a tester comes out with only moist crumbs (or until it reaches 190 degrees internally). Allow to cool for a half an hour or so in the pan, and then turn out. It slices better when it’s cool because it’s a very tender quick bread. Slice into thick slices and serve with softened cream cheese or butter. I got eight thick slices out of my loaf. If you don’t eat it immediately, slice it and freeze it with parchment between each slice. Then, you can microwave a frozen slice for about 45-60 seconds to defrost and heat. Happy Hallowe’en and blessed Samhain! In honor of the holiday that marks the beginning of the dark quarter of the year, I thought I’d talk a bit about the stories and legends I’ve encountered that deal with this spooky time of year. Hallowe’en falls at a time that is approximately halfway between the autumnal equinox and the winter solstice, so it’s about halfway from an equinox to the longest night of the year. And, really, Hallowe’en is around that time of year where you really start noticing that the days are getting shorter. All of a sudden, the sun isn’t coming up until I’m on the train, with my morning commute well under way. In fact, it’s probably not a coincidence that we change our clocks to give us a bit more light in the mornings right around Hallowe’en. In folklore and legend, Hallowe’en or Samhain is the time at which the boundary between light and dark becomes thinner and, in many traditions, the veil between the mortal world and the spirit world is more easily traversed. In neo-Pagan traditions, Samhain is a time to meditate on your ancestors. It’s also no surprise that this thinning of boundaries would bring spirits and ghosts into the world, hence the Hallowe’en imagery involving ghosts and other supernatural beings. Divination was also said to be more successful at this time, which is a part of a lot of old Hallowe’en traditions, and most of which center around determining when and whom one is to marry . But I’m here for the stories, not the general descriptions of traditions. And one of the stories that has the most explicit link to Samhain is the story of the Kelpie in Celtic mythology . The Kelpie is a water spirit that takes the shape of either a human or a horse, and lives in water. In the Celtic story of the Kelpie, the sons of the chiefs of the tribes of Ireland are lured onto the back of a Kelpie in his horse form and dragged into the water because they stick to the horse once they’ve touched him (similar to the story of the goose that lays golden eggs). One man escapes by cutting off the hand that touched the horse, and goes on a quest to try to free the princes. He encounters a magician who tells him that the princes have been taken to the Otherworld, which is the Celtic spirit world, and the only time they can be brought back is during the feast of Samhuinn, when the veil between worlds is thin. I would definitely suggest reading the original story (or at least listening to the Myth Podcast treatment of it) because I haven’t done the complexities of the plot justice here, but suffice to say, they are successful in rescuing the lost princes. Another legend that I’ve come to associate with Hallowe’en is the traditional folk theme of the Wild Hunt. I first encountered the idea of the Wild Hunt in the book Dead Beat by Jim Butcher in his Dresden Files series. In the book, a wizard can summon the Wild Hunt on Hallowe’en because it is the best time for the spirits to come through. After reading the book, I looked up more legends and folktales of the Wild Hunt and found that it has a deeply-rooted tradition in Germanic and Celtic folklore . In Germanic traditions, the Hunt is often led by Odin or Woden, as a god of both battle and the dead. In Celtic tradition, the hunt is led by legendary heroes, including King Arthur in some traditions. There are also varying derivative traditions that have the hunt being led by any of a litany of unpopular figures at the time of the particular story. In general, the stories of the Hunt have evolved to be a party of infernal or evil characters. There is even a story in the American wild west, immortalized in song by Stan Jones, of damned cowboys who hunt the Devil’s cattle across the sky . They warn the cowboy who sees them that he will join them unless he changes his ways (presumably to become a better person, although it’s unclear why the cowboy is particularly in danger of becoming damned). In this version, the unseen “leader” of the Hunt would be the Devil himself, dooming the spirits of damned cowboys to chase his herds forever. While the story doesn’t explicitly take place on Hallowe’en, it seems as likely a “dark and windy day” as any for a visitation of damned spirits. Finally, no Hallowe’en festivity is complete without a Jack o’Lantern. 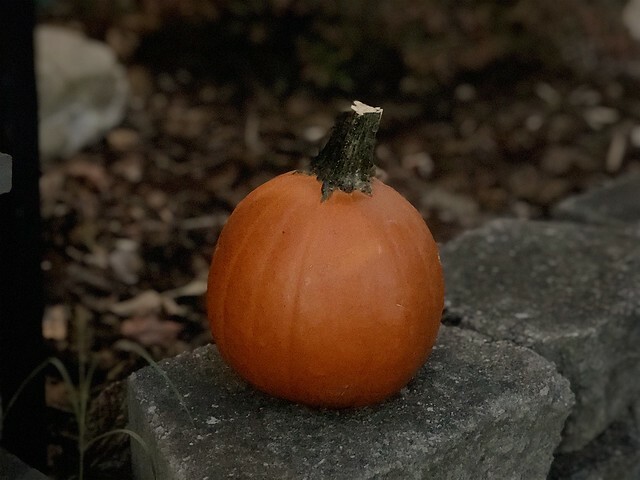 So I thought I’d talk a little about the folkloric story of “Jack o’ the Lantern.” In Irish folklore, there’s a story of “Stingy Jack,” who borrowed money from the devil and then tricked his way into not giving up his soul when the debt came due . Through a series of annoying deceptions, Jack ended up being barred from hell by an exasperated devil, but because he wasn’t exactly a good person, he wasn’t allowed into heaven. Doomed to walk the earth as a spirit for eternity, Jack found himself possibly worse off than if he’d just gone to hell. The devil ended up taking a bit of pity on him and gave him a perpetually-glowing ember to help him light his way, which Jack put in a carved-out turnip. From then on, he was known as Jack o’ the Lantern and was something of a will o’ the wisp type of spirit. Originally, people on the British isles carved turnips before the tradition was taken to North America, where there were pumpkins. So there you have three stories of the season. What’s your favorite Hallowe’en or Samhain story? At first glance, A Little Tea Book appears to be a typical decorative book. It’s the kind of brief, heavily-visual book with just enough text that my in-laws might put it in a guest bathroom for a little light reading on the toilet. But such books are generally pretty to look at without a whole lot of substance. Granted, coming from a pre-eminent tea authority, author, and illustrator, it’s likely to be enjoyable, at the very least. But A Little Tea Book went beyond these superficial expectations and surprised even me. 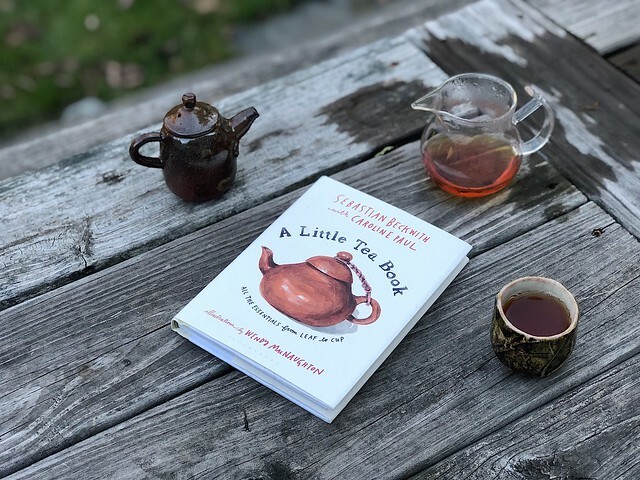 A quick note about the title: I keep thinking the title is The Little Book of Tea, which reminds me the episode of Black Books where Bill swallows The Little Book of Calm. And similarly, I have utterly devoured this book. Though I haven’t gained preternatural skills in meditation or tea from my consumption, I found the entire book thoroughly enjoyable. The book combines information about the botanics, history, processing, and enjoyment of tea written by a foremost authority with beautiful photographs and illustrations to perfectly offset the text. It begins with the botany of the tea plant, and how processing turns a single species of plant into a diverse array of types of tea, before going into the differences between varieties and cultivars. 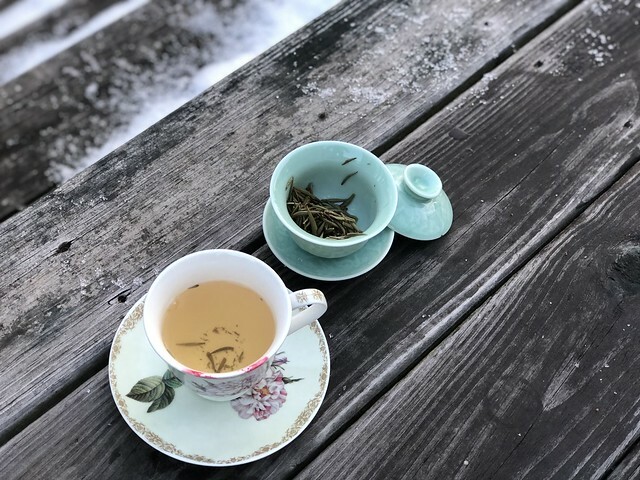 I found this particularly fascinating because, while I know that only Camellia sinensis can truly be considered tea, and I have a passing familiarity with the two major varieties, I’d never gone into much detail about the cultivation of tea. I also appreciated the personal anecdotes about rarer types of tea. From there, the book discusses the cultural context of tea, describing the naming of tea and how history has affected global distribution and tastes in tea. I was intrigued by the historical background, particularly how politics and economics drove different tastes around the world. And finally, the book goes into the enjoyment of tea. I appreciate Sebastian’s informal, forgiving tone on the subjects of flavoring and adding to tea, neither demonizing either practice, while not encouraging it. He suggests tasting teas as they are, but ultimately admits that the best way to drink tea is the one that you enjoy. After all, tea rules, as he says, are less rules, and more “rules of thumb” (or as I like to say: tea rules are like the pirate code; they’re really more like guidelines). And through the whole book, the visuals are fantastic. Gorgeous photographs of tea growing, processing, and brewing are interspersed with Wendy MacNaughton’s watercolor illustrations, which are both beautiful and informative. 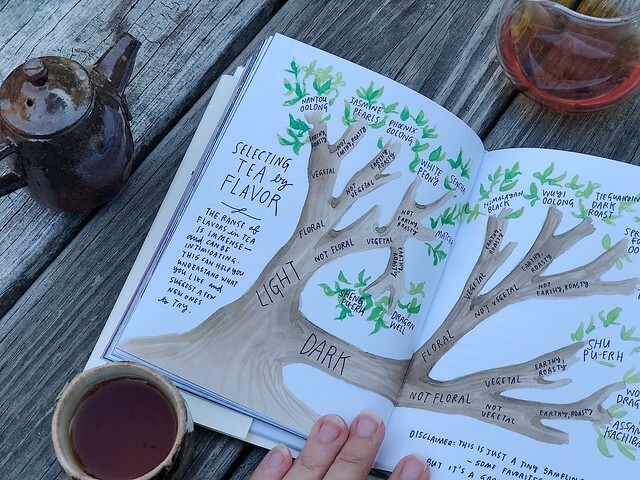 My favorite illustration would have to be the “flavor tree” of teas. But of course, I would expect nothing less from the illustrator of Salt, Fat, Acid, Heat. All in all, I would consider A Little Tea Book a delightful gift for both the veteran tea-lover as well as an enthusiastic novice. It is both beautifully designed and illustrated and contains a non-threatening, yet informative, introduction to the culture and enjoyment of tea. NB: I purchased this book with my own money and have not been given any incentive to review it. All thoughts are my own. This is another of my random, slightly-rambly posts where I work through my thoughts on something that has been on my mind for a while. You see, I consider myself at least partially a “beauty blogger” because I do post about beauty products (mostly skincare). And since I review beauty products, there is an underlying assumption that I think of myself as some sort of authority, no matter how minor. This train of thought started when I posted a selfie on Facebook and someone commented on my “lovely glow.” Now, I believe this was a pregnancy reference, and I played it off with a joke about being excited about food, but a small part of me wanted to point out that I do spend more time than the average person thinking about my skin and caring for my skin. I definitely have honed my personal routine to have the best effect on my skin that I can get. But the fact is that I am also somewhat a lucky person. Oh, don’t get me wrong, I’ve had struggles and skin issues, but nothing major. And while I credit some of my current success in good skin to proper care, I’ve never had a major skin issue. In fact, if I tried to see a dermatologist in the US, even at my skin’s worst, they’d probably consider me silly. Don’t even get me started on my hair. No, I’m not model-gorgeous, but I have a perfectly acceptable face and figure, and I do have rather nice hair. And my hair is a good place to start. You see, one of the reasons I have rather nice hair is that my hair is incredibly resilient. I have thick, straight, strong hair and quite a lot of it. It’s graying, but it a somewhat chic way, with a streak that comes through at my part in a kind of Lily Munster sort of way. I’ve even been asked if I dye it in. So when I talk about my hair care routine, yes, I use best practices, avoid heat, wash as little as I can get away with, and make sure to use gentle tools. But I also know that my hair didn’t become any more brittle that one time in high school when I dyed it with boxed dye twice in the space of 48 hours (I didn’t like the color the first time). My hair is a good example because I could probably heat-style almost every day and dye it every month and still have pretty nice hair. At the very least, I have so darn much of it, it would take a long time for the wear and tear to show. So if you have thin, dry, curly, delicate, damaged, easily-damage-able hair, your mileage is certainly going to vary. That’s not to say that I don’t want you reading my blog, but I’m not necessarily going to be as helpful to you as someone with more trouble with their hair. The same is true for skin. I was blessed with trouble-free skin as a teenager, and had some hormonal issues pop up later in life. I managed to wreck my skin barrier with high-pH cleansers and a lack of proper moisturization, but even when I was “breaking out,” I generally got maybe 4 or 5 spots at a time. It wasn’t even on the same level as some of the truly amazing skin transformations I’ve seen among bloggers I follow. And it’s never been to the point where I would consider much in the way of strong prescription treatment really worth it (I did Curology for all of three months, I think). I will admit that my skin is pretty calm. And since my hormones stopped fluctuating on a monthly basis, it’s been even better (we’ll see how that goes in a few months…). 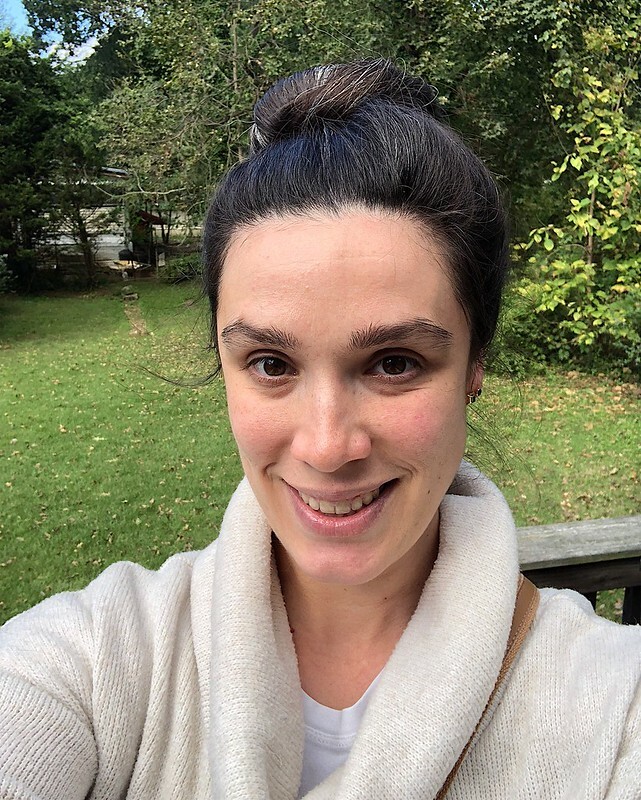 Again, I’m not saying you shouldn’t read this blog if you don’t have generally good skin, just that most of my beauty reviews aren’t going to feature drastic before-and-after results, but more a sense of how I like the feel of a product and whether I notice its subtle effects. And I think that’s so important to admit as a person who reviews beauty. It seems like it’s going to damage your credibility to point out that you might not actually need some of the products you tout. But I would rather see a blogger be honest about the fact that their a bit genetically gifted than constantly compare myself to people who are always going to have better skin than I do. And I think it’s even more important to realize that the people who have the “bad” skin might actually be more informative in the long run if you’re actually looking for products that might make a difference in your skin. I’d rather see someone with a chin full of hormonal acne tell me what took them from cystic eruptions every month to just a few lingering clogged pores and residual pigmentation marks than listen to Regina George tell me what she uses on her nonexistent pimples. It’s why I like to follow bloggers who are over 40 and bloggers who have made their struggles with acne public. No, I do not want to watch anyone squeeze anything on their face. But if I want to try a wrinkle cream, I’d rather see it reviewed by someone with actual wrinkles. And if you’re going to use Botox, yes, I’m thrilled that you’re going to tell me about it, rather than pretending that your flawlessness is entirely the work of your 12-step over-the-counter routine. So that’s where I am with this right now. I hope my readers continue to enjoy the posts I post, but know that you’re probably never going to get a before and after photo from me because, frankly, the benefits I get from any given product don’t tend to be dramatic enough to show up on a photograph. But hopefully there is some merit to my opinion anyway.